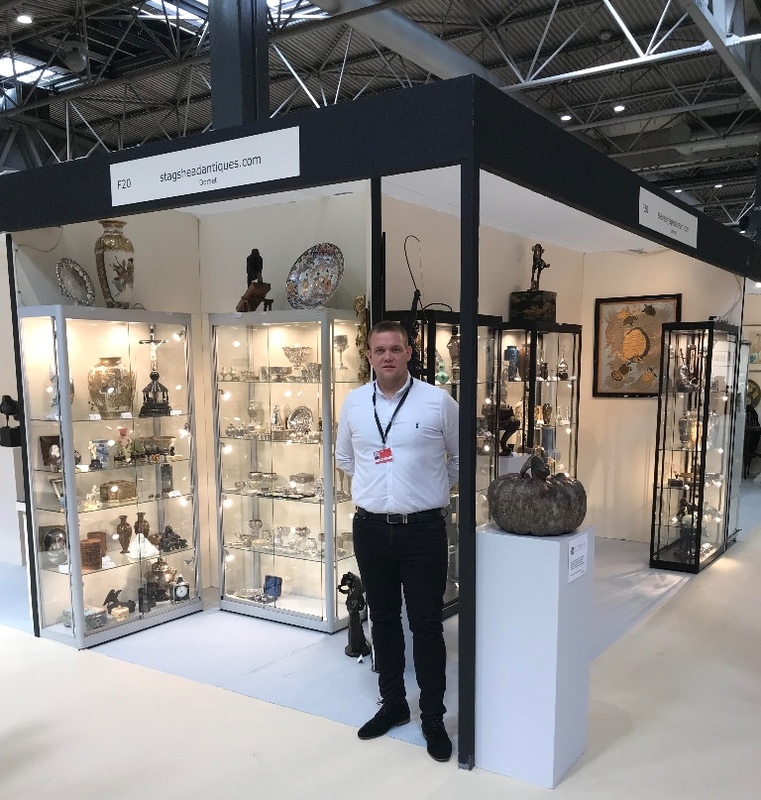 As I sit and write this letter from the comfort of my home in sunny Dorset the curtain is just about to come down at the Antiques for Everyone Summer fair, at the NEC in Birmingham, Ryan is ably representing our brands for the final three days of the six day jaunt, whilst I attend to other pressing business and personal matters. As usual we arrived early on Tuesday for set up day, a formality now, after so many events it usually runs like a swiss watch, then into Wednesday for final stand preparations and of course the vetting process, in readiness for doors opening at 11am Thursday morning. There was however a slight twist to our stand layout for this particular fair, we had recently been invited to purchase a large quantity of Silver from a single owner collection, as well as mixed Oriental and European items from an estate in the North of England, this event was a perfect opportunity for Ryan to host these none Japanese items under our Stagshead antiques.com brand. Onto Thursday 11am, and It came as no surprise to be greeted with the usual rush of dealers, collectors and regular visitors from home and abroad, by the time we had a chance to grab our first coffee break it was around 3pm and the cabinets had been stripped of all manner of goods, and across all price ranges, with multiple sales to Japanese, German & Australian visitors as well as UK based dealers and private collectors, the event remains an enigma, and like no other opening day at any other fair we have experienced, I would like to personally thank all of our visitors during the four day event, and many thanks to our fellow dealers and of course the organisers who help this fair maintain its unique position in the market place, in what are quite testing times. Our next visit to the NEC will be in the cooler Winter months on the 15th-18th November, complimentary tickets will follow later in the year. 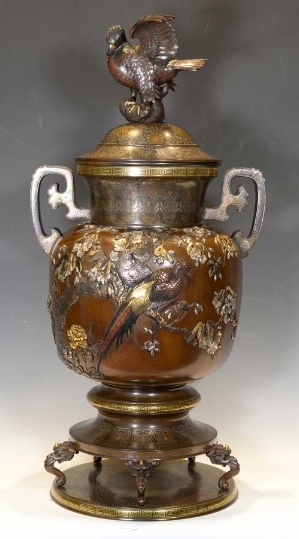 In last month’s members area we featured a huge mixed metal lidded Vase attributed to the Ikeda Gomei company. We are delighted that this vase has found a new home in an important high quality Japanese art collection that we are putting together for a UK based client. With multiple trips overseas already in the diary, invitations to view items from two or three single owner collections, including one very exciting call from the USA, I can certainly promise some fascinating market fresh Japanese works of art in the coming months, some of which will feature exclusively in our members area. Finally for this month please take time to visit our exclusive members area to fully appreciate this magnificent Carved Ivory Okimono of a beautiful Bijin by a leading Tokyo school carver Kikuchi Godo. With the pending UK legislation on Antique ivory sales this could be your last opportunity to own such a magnificent one piece Japanese Ivory Okimono, we will discuss the pending legislation in future newsletters, together with any updates that we may have at that time. In the meantime the trade body we belong to Lapada, together with other trade organisations such as Bada and Cinoa, are lobbying the government and the House of Lords to hopefully draft some fair and workable proposals to protect not only the antiques industry, but also to hopefully preserve the history and heritage of centuries of antique Ivory production and of most significance the conservation of the magnificent beasts roaming the plains today, a difficult balance admittedly, but one that must be achieved in the right way! !